katiemaytoo quilts: A new year, a new blog! But last week, they announced some changes that have us all reeling. Many of us have moved here and I decided it was time to get a "grown-up" blog, too. I'll be learning as I go and hope the friends I've made through apq will find me and I'll make a few more as I go! I may double post for a while, but that seems like a lot of effort. But to get things started, here is my most recent post from my other blog. Thanks for stopping by! I haven't been quilting much yet this year. For some reason, I just don't have the motivation right now, but maybe it's because I'd rather be curled up under a quilt with a good book than sitting in my sewing room (which can get a little chilly when the wind blows up from the south) working on one. I don't think the picture does the doll much justice, but she is a cutie! 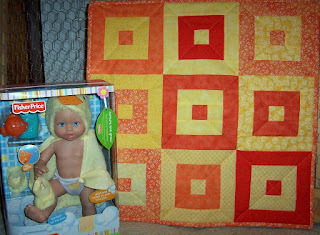 The quilt pattern came from the "book" "The Little Box of Baby Quilts" by Jenny Wilding Cardon. I say "book" because it's the cutest little box with individual laminated cards with simple baby quilts on each one. Such cute marketing, so of course I had to have it! I've been eyeing this "Little Log Cabin" pattern for a while, but didn't have reason to make it until now. It's completely made from leftovers...can you tell I make bright baby quilts?! Now for my upcoming inspiration. My brother and his (quilter) wife got me a gift certificate to Connecting Threads. Now I often drool over their catalogs, but never order because I can't justify my purchases. Well, with a gift certificate, I can, but then I couldn't decide. Nothing was jumping off the pages (paper or web) screaming "BUY ME!" (Isn't that the way it goes when you have money to spend?!) Until the latest catalog arrived in my mailbox Monday. Birdies on a Wire was on the cover and I knew that's how I would spend my gift certificate. I ordered it yesterday and it's already on the way! I also ordered a sampler pack of 2.5" strips of the fabrics and a half yard for lining because I'm going to make myself the Jelly Bag I made for my nieces for Christmas (only this time, I'll use strips instead of a solid piece for the outside). I can't wait!!!!! I hope you are all busily sewing away. I understand it's cold down in Texas where some of you are (above-mentioned brother and wife are visiting family there right now and complaining! ), so stay warm under those quilts and remember, it's not going to stay that cold where you are nearly as long as it's going to stay this cold where I am! PS I almost forgot my other inspirations! The hubby and I had our own "Biggest Loser" contest because he had gained back much of the weight he lost doing the same contest at work earlier in the year. Well, I won...all 4 pounds I lost (I didn't really work at it until the last month and I really didn't have much to lose - just a little belly pooch, but apparently the hubby worked even less hard...I don't think he took me seriously as competition because I wasn't making a fuss over choosing juice over pop, salad over fries and gum over snacks)...so I bought 4 books as my prize. One is a bread baking book, one is quilting but on pre-order and the other two are also quilting. I'll try to remember to get a picture for my next post!